The Ad that I chose for this assignment is from 1977. 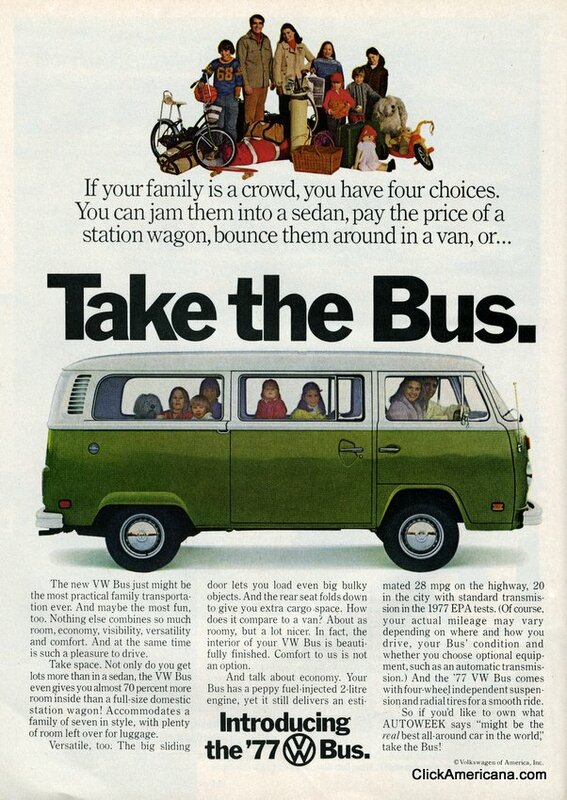 I couldn’t find any information about the designer but this Ad is from Volkswagen promoting their bus. I really like the style and the layout of this Ad. I like the image of the car in the middle with the big text on top of it. The text has been separated in three columns and it looks well designed because the columns on the sides are underneath the wheels. The text doesn’t have any serifs at the end of the strokes. There is no visible thick-thin transition in the strokes. Also, the letter forms are the same thickness all the way around. The designer used a Serif font and a Sans Serif font to create contrast for this Ad. Serif fonts have a thick/thin contrast in their structures, sans serifs generally are monoweight. This typeface contrast is complemented by different sizes between them. This assignment helped me picture and understand the contrast between two typefaces from different categories. It’s not enough to use different categories. Designers also need to complement their design with size and weight contrast.